At least 20,000 people have marched through central Paris protesting against the French government's plans to cut jobs in the education sector. The protestors are also unhappy about President Nicolas Sarkozy's plans to force schools to stay open in the event of strike action. 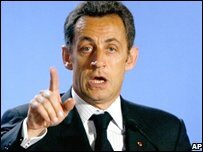 Mr Sarkozy was elected a year ago on a platform of reforms, but many of them have provoked stiff opposition. Separately, fishermen angered by rising fuel costs blockaded La Rochelle port. A cordon of 90 fishing boats cut off access to the commercial harbour La Pallice on France's Atlantic coast for a fourth day running. Fisherman also blocked off three fuel depots that serve much of western France, by piling palettes up on their access roads. They promised to maintain their protest until talks with the government open on Wednesday, AFP news agency reported. In Paris, organisers said 45,000 people joined the protest against education reforms, though police put the number at 20,000. Unions are hoping that a head of steam is building up against the government's reform plans, says BBC correspondent Hugh Schofield in Paris. Ministers want to cut 11,000 jobs in schools and universities this year, mainly by not replacing those who retire. They say the number of pupils in France has been falling in recent years, while the number of teachers has stayed constant or gone up. But the protestors accuse the government of trying to roll back public services. They are also angry at an unexpected initiative by the president after a nationwide school strike on Thursday. President Sarkozy promised that evening that a law will be passed making it compulsory for schools to look after children on days of strikes, so that parents could go to work. To the unions, this is a limitation on the right to strike. More public sector strikes are scheduled for Thursday over plans to push back the pension age. But the president has so far made the calculation that most people accept the changes that he has promised, and there is no sign of him backing down, says our correspondent.